Close view of notched-log construction, "piece sur piece"
The Pointe Coupee Parish Museum, located on the west bank of False River near Parlange Plantation, is architecturally significant because it is a rare example of a log cabin type construction in a Creole type house. The original portion of the house dates from the early 19th century. It has a typical Creole plan, consisting of two rooms, front and rear galleries, and a single central chimney. This portion is constructed of horizontal logs with full dovetail corners. There is no gap between the logs. Before 1840 a boussilage (mud and animal hair mixture applied inbetween timbers) addition was made to the south side, giving the house a width of three rooms. At that time the double pitch roof was added, along with the present chamfered column galleries with their exposed rafters. The chimney top was later replaced, along with some of the doors and windows. A small bathroom and kitchen have recently been added in the southeast corner of the house. 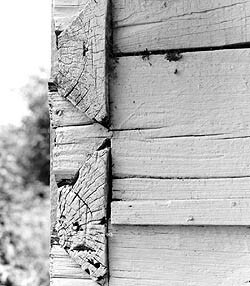 This type of notched-log construction is not uncommon in French Canada where the architectural style is described as "piece sur piece." Creole architecture is fundamentally a vernacular tradition. This means a limited number of choices were available to the builder at each stage of design and construction. Two stages of building development were important. The first stage was the basic house type, which were rectangular, usually small buildings in which the front door was located in the wall parallel to the roof ridge. The second stage of development was the method by which Creole builders added to the basic house type to form a larger dwelling. This expansion was accomplished by surrounding the small basic house with one or more sets of ancillary rooms and porches rather like rings around a central core. These expansion spaces might include side rooms, new galleries, an open rear porch called a loggia, and small corner rooms flanking the loggia. Such corner rooms were called cabinets. The Creole tradition is the principal non-British colonial architecture tradition in the Eastern half of the United States. 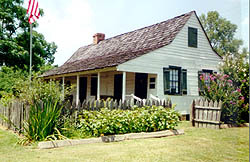 The Pointe Coupee Parish Museum is located at 8348 False River Road (State Hwy. 1) in New Roads. It is open 10:00am to 3:00pm daily and by appointment. Call 225-638-7788 for further information.